Cartier does MySpace, Preppy at Milan Fashion Week?! The Princess can’t quite figure out if Grandmother is approaching this particular holiday doing the proverbial ‘rolling over in her…,’ or privately winking at me as I tell Mommy about the newest member who is posting on the MySpace website: Cartier. The jewelers on Fifth Avenue. Exactly. We shouldn’t be surprised; Neiman‘s did something very similar with YouTube last year as part of their 100th Anniversary celebration. (Yes, we said YouTube.) And anyone thinking TP is revving up for a rant (how very unPrincess-like, we would never do that!) is mistaken; we shan’t be making any snarky comments about Cartier’s marketing efforts. The firm has donated more than $2,000,000 to sixteen different charities through sales of bracelets like the one above. The bracelets sell for $975 with $200 of each sale going to one of the charities, covering a broad spectrum from the Boys & Girls Clubs of America to the Ovarian Cancer National Alliance. The looks above include eye-catching pants on the left from Dolce & Gabbana, the aqua shirt and khaki slacks are by Versace, and Enrico Coveri did the pieces on the right. A reminder these are from the shows presenting looks for the Spring/Summer 2009 season, so they are not available now. For those not familiar with Coveri, he has been on the scene longer than even The Princess suspected, and we show a few of his designs below, all of which we find quite attractive. Across the pond they are still playing a bit of tennis, and this evening I am reminded that in tennis as in many other sports, good sportsmanship is defined by one’s conduct both on and off the court. 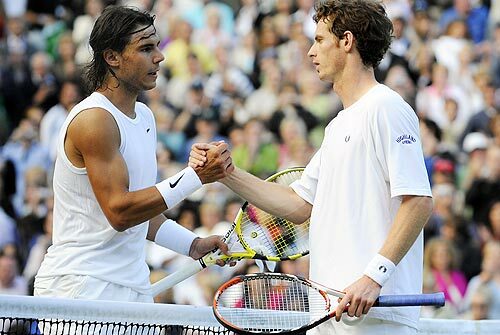 We leave you with Rafa Nadal’s blog post on his win over England’s Andy Murray at Wimbledon, securing his place in the Finals. Here is his post as it runs on the Times of London’s site, “The Crowd Were Fantastic – And I played Not Bad Too“.